Trek Machame route to Uhuru Peak on Mount Kilimanjaro, the highest point in Africa. Climb the highest freestanding mountain in the world and help support life-saving research into leukaemia and other blood cancers. Our trek takes the Machame route, allowing gradual acclimatisation to the altitude and an excellent chance of reaching the summit. We pass through thick forest, moorland and scree en-route to Uhuru Peak, the highest point. This is a tough trek at altitude, climbing one of the most impressive mountains in the world – are you up for the challenge? Every day 26 people are diagnosed with leukaemia: that’s more than one every hour. Our vital work aims to translate research findings into new treatments as quickly as possible, so patients can live better, longer lives. 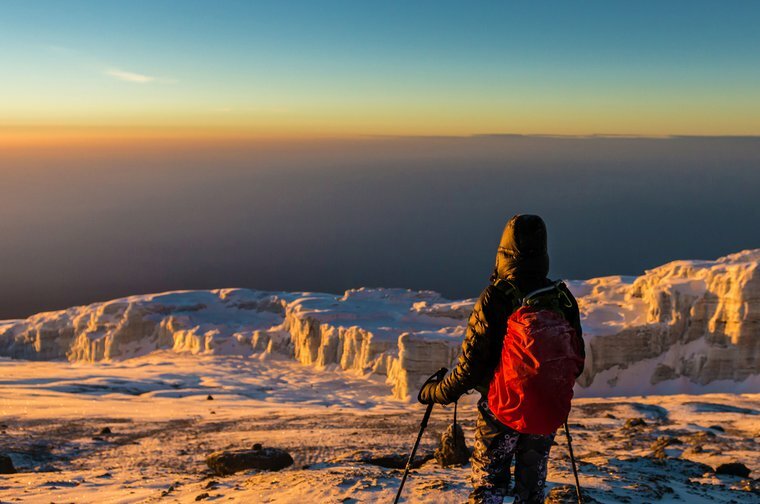 If you’re feeling inspired and raring to go, book your place on the Kilimanjaro climb today. We work in partnership with Discover Adventure for the operation of our challenge events. Discover Adventure have over 20 years of experience in operating adventure fundraising challenges worldwide. Voted Best Small Escorted Adventure Company in 2016 and fully ATOL protected, you can be sure you are in safe hands on your challenge experience. Or, to find out more, register your interest through our form below. You can also contact our Fundraising Team who will be happy to answer any questions you may have and help you book this challenge of a lifetime. Call us on 020 7299 0722 or email simona.abis@leuka.org.uk. I'm interested in climbing Kilimanjaro - tell me more!